India’s longest elevated road, the Eastern Freeway Project (EFP), is likely to be thrown open to traffic on Maharashtra Day (May 1). The construction work was completed on Saturday. The 16.4-km-long facility is being constructed by the Mumbai Metropolitan Region Development Authority (MMRDA) as one of the showpiece infrastructure projects in the Maximum City. The freeway will connect South Mumbai to Wadala and onwards to Ghatkopar in the eastern suburbs. While 12.1 km of the EFP is completely elevated, the remaining 4.3 km will have a 500-metre-long twin tunnel. “Such kind of a tunnel is being built for the first time for an urban road in the country," MMRDA chief engineer Sharad Sabnis told reporters. Once thrown open to traffic, the EFP will be India's longest elevated road, MMRDA officials say. 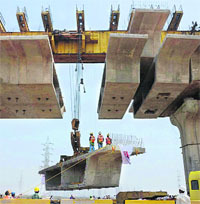 At present, the country’s longest elevated road is the 10-km- long overpass on the NH 1 in Panipat which was thrown open last year. “Over 2,000 workers, 100 engineers and other officials toiled for more than two years with 1.6 million bags of cement, 32,000 tonne steel, 3,346 girders and 2,600 km-long high-tension steel wires to complete the first part of the EFP,” said MMRDA officials. The first part of the EFP will be a boon for the northeast-south traffic movement in Mumbai, passing through some of the most congested areas. It will be a high-speed corridor since it won't have any signals and thus would allow quick dispersal of traffic from South Mumbai to the eastern suburbs and onwards to Thane and Raigad to other parts of Maharashtra.